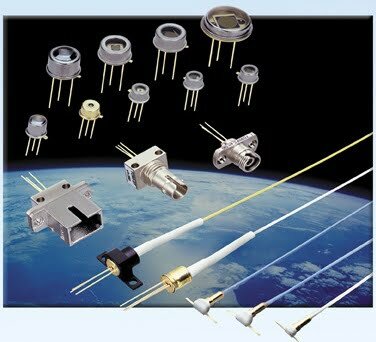 Fermionics Opto-Technology is an independent manufacturer of InGaAs photodiodes for data, voice, and video communications; large-area photodiodes for instrumentation and sensing applications; optical receivers to 1 Gb/s; and linear and digital arrays. Fermionics' offers high-speed InGaAs photodiodes for high speed analog and digital communication systems, LANs, FDDI, instumentation, and sensing applications. All devices are fabricated with planar-passivated technology, photosentisive surfaces and are broadband antireflection coated. We offer large-area InGaAs photodiodes for instrumentation and sensing applications. Responsivity in the wavelength region of 800 nm to 1700 nm is excellent. All devices are fabricated with planar-passivated technology, photosensitive surfaces and are broadband AR-coated. At Fermionics Opto-Technology we are dedicated to serving the needs of a diverse customer base by focusing on quality, timely delivery, and customer design requirements. The company was founded and incorporated in the State of California in 1991. When you click "Send Request", we will send the contact details you supply to Fermionics Opto-Technology so they may respond to your inquiry directly.